SWR offer sensible design solutions for the acoustic guitar amp market! SWR have a great reputation as bass amp manufacturers. They took the experience from building high headroom clean bass amps since 1984 and adapted the concept for the acoustic guitar market already back in the 90s. The California Blonde II hit the shops around 2006. Most small PA systems like Mackie SRM450 use a 12″ speaker since this can handle bass down to say 70Hz with ease. That’s lower than your low E string, which is 82.40Hz. Anything lower than that is taken care of by the subs. So to build an amp for an acoustic instrument like the guitar, it seems logical to use a similar technology. Built in power amp, 12″ speaker and a tweeter to cover the high notes. Since a lot of acoustic guitar players sing as well it makes sense to accommodate for that should the venue be of a smaller size. 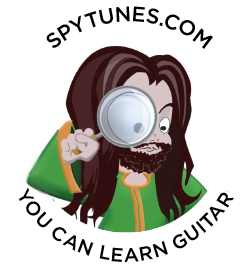 A microphone input also means you could use a microphone should the guitar not have a built-in pickup system. Purists might even combine two microphone systems from the same instrument. This could be a magnetic, piezo, internal contact microphone, a condenser microphone inside the guitar or on a microphone stand in front of the guitar. The California Blonde caters for all these needs. When combining two microphones like this you sometimes get phase issues so a 180 phase switch is included. As well as this we get an effects loop for external effects or a loop pedal. Should this be too complicated for you, you could just use the internal spring reverb which comes with a foot switch. As if all these features wasn’t enough you can add an extension cab (Baja Blonde). Now you are very unlikely to have any volume problems since the system now delivers 200W of clean high headroom power (CB II on its own produce around 150W). When using the California Blonde in a live situation with a drummer, it may be a good idea to place the amp on one side of the drum kit and the extension cab on the other. This setup would enable you to clearly hear your acoustic guitar, even if you move around on stage. Through an extra monitor at the front of the stage, you could then have only your vocal (and possibly a bit more guitar) giving you a very clear idea of what you are playing and singing. This full setup should be possible to find for around $1300 ($800 for the amp, $500 for the extension cab). The setup could be used as a small PA system or, as described, a very powerful, straight to the point acoustic monitoring setup that can handle band volumes. Reading many user reviews and considering this system has been in production longer than most acoustic amps, it seems to be a very sturdy, flexible and reliable unit. The amp weighs in at 23kg (51lbs), the extension cab, which is passive is 16kg (35lbs), so not too difficult to lug around but you will need a car to get it to the gig. SWR demonstrate a healthy look at building acoustic amps. Using high-quality components and a straight to the point design, their amps should present a hassle-free environment for the gigging acoustic guitarist. 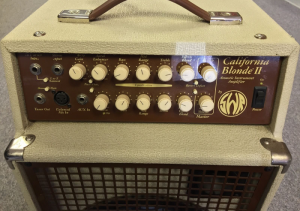 Should the California Blonde II seem a bit too full on for you, you could also check out the Strawberry Blonde II which is a similar amp, using a 10″ speaker and 90W. One little Strawberry will not hold up should you have a drummer on board but it does offer better portability.